Everyday content creation is becoming harder and harder, as everyone becomes online publishers. Whether you are working in publishing, electronics, white goods or fashion, everyone is publishing huge amounts of content. Previously I have written about 6 tools that can help inspire your content, using social media, Q&A websites and keyword tools. One of tools that I mentioned was Ahrefs Content Explorer and how, similarly to BuzzSumo, it provides information on the most shared content on the web. In this post, I am going to show you how to use Content Explorer to provide you with 1000s of URLs to help further inspire your content creation by either providing new ideas, improving content, or combining to provide a more valuable resource. Now that is out the way, lets get started. When opening the Ahrefs Content Explorer tool, you need to start by entering a keyword topic. As a first step to finding your content inspiration, it is key to start with something as broad as possible, so that you can get a clear understanding of what content is succeeding within your market. Once you have entered your topic, it is essential that you exclude your own content from the mix so that you do not skew any results. To do this check the exclude radio button on the left hand side under the Domain Name feature and add your own URL, in this instance I have removed our domain White.net and hit the search button. This returned over 200k results, from websites such as Forbes, Mashable, Moz and the Telegraph. It goes to show that lots of people are talking about SEO, and not just on the websites you may consider a competitor. As a starting point, export the data so that you can start to collate a number of URLs to analyse and provide you with your inspiration. When exporting the data you will be asked whether you want a fast export of 1,000 rows or a full export. This is going to depend on your subscription level as to how many credits you have or want to use. Once you have downloaded the data, you will need to create two extra columns. One is for the topic, and the other is the domain. This will help later in the process when filtering, to identify opportunities. Using an excel formula you can automate filling in the domain column, more information can be found here. Once you have completed a number of searches, ensure that you dedupe the URLs gathered to ensure you only have unique options. This step allows you to see what is being created across the web for your search topics, but what about those that you class as competitors? What works for your direct competitors? The broad searches that you created previously are likely to have already provided you with lots of inspiration, but now it is time to be a bit more targeted. Understanding what is working for your competitors is a key aspect to any search marketing campaign, so determining what is most popular is key. This step is very similar to the first, but you are going to include your competitor domains only. Remove any search term that may be in the search bar, and instead include your competitors domain in the search box on the left hand side similar to when excluding your own domain earlier. By hitting search now, you will be presented with content that is only available on the domain that you entered. The example above shows the most popular content on the State of Digital website ordered by the median number of shares in descending order. What you may notice is that just because you generate lots of shares, it does not automatically mean you get lots of links. It is at this stage that you have a choice on how you want to proceed. You can either download the report as is, with every topic shown or you can use the same or similar terms you used earlier to help with the targeting. Personally I would chose to download every topic to be as thorough as possible, but each situation is different. Once you have decided what to do, you need to download either one or multiple spreadsheets, and add them to your existing set of data. Do not forget that you need to tag each URL with a topic for later. Now repeat this step with as many competitors are you feel necessary. Note: Not every domain will be in the Ahrefs database, but it is growing daily. By conducting the above process I have managed to create a spreadsheet that has over 8,000 pieces of content with social and linking metrics, that I can use to inspire the content that I will create going forward. By browsing through the list of URLs filtered by a specific topic, I managed to come up with a large number of content titles and ideas that will allow me to create fresh content over the coming months. Looking at somebody else’s content and recreating it is not stealing, as long as you are providing value by creating a better resource. When looking for content that could be recreated and improved, I filter the data by topic and the date. This allows me to see any content that has been created within the past 12 – 24 months. If the content was well shared and linked to, and has not been covered in depth in the last six months I add it to my list. Within a few minutes I have a list of potential ideas including this piece that was created in 2012 over on Search Engine Journal: The Definitive Guide to Local SEO. This piece generated a large number of shares and links, but more importantly it can be updated due to the latest updates implemented by Google. Sometimes you come across a number of posts that are very good, but just need that bit extra added to them. This is when combining content ideas to create a more indepth and valuable resource is beneficial. Further analysis of the data that I have gathered has led to me to identify 4 different blog posts that fit very well together, and if combined would provide a valuable resource. It could even be turned into a presentation and whitepaper, increasing the potential for shares and links. Once you have a list of content ideas, it is time to prioritise your efforts on what you feel will be the biggest return. Using the right tools, having the right process and a little bit of time, you can find thousands of pieces of content that will inspire you and your campaigns. It has helped me, so I hope it will help you. Are you taking these steps or something similar to inspire your content creation? I would love to hear your thoughts in the comments below or over on twitter @danielbianchini. Daniel Bianchini is the Director of Services at White.net, a creative digital marketing agency based in Oxford, UK. 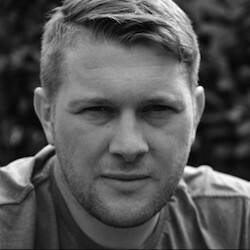 Having been in digital marketing since leaving University, Daniel has worked in-house at Dixons Stores Group (Dixons Carphone), with many leading UK brands and helped start a digital marketing agency based in Hertfordshire.